Jules Verne Trophy: Around the world in 40 days? London, England (CNN) -- Two of the world's largest sailboats are set to embark on a grueling head-to-head race to go around the world in 40 days. The two vessels are competing for the prestigious Jules Verne sailing trophy, created in honor of the French writer's legendary character, Phileas Fogg, who circumnavigated the globe in 80 days. The two huge trimarans are ready to set sail any day on the treacherous voyage that will see them battling giant waves and storms and avoiding icebergs in the Southern Ocean and Antarctica. Franck Cammas, skipper of 32-meter long, 10-person crewed "Groupama 3" says his team are praying for the good weather that means they can set off on their voyage. "The team is now really impatient to leave," Cammas told CNN. " ... We really need better weather to go through the dangerous Southern Ocean." he added. But the perils of the Southern Ocean are not the only problems that can foil a Jules Verne attempt, as Cammas well knows. This is his third try at speed sailing around the globe. Each of his two previous attempts ended in disaster when the boat crashed under the pressure of the speed it was traveling at. And these boats can go fast. 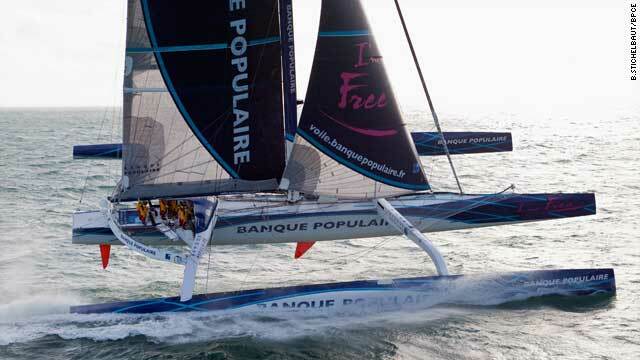 "Our trimaran can go up to a record speed of 47.16 knots (87 km per hour)," said Pascal Bidegorry, skipper of the other boat in the competition, "Maxi Banque Populaire V."
The 40-meter long (141 ft), 16-man crew boat is the largest trimaran (three-hulled boat) in the world. It also holds the world record for the fastest crossing of the Atlantic on a boat. French sailor and one of the creators of the Jules Verne cup, Titouan Lamazou says that this attempt is particularly exciting as two boats are competing against one another. "It is a coincidence that both trimarans will now be leaving at the same time," Lamazou explained. Boats competing for the cup race against the time of the previous winner. "It will create more excitement. 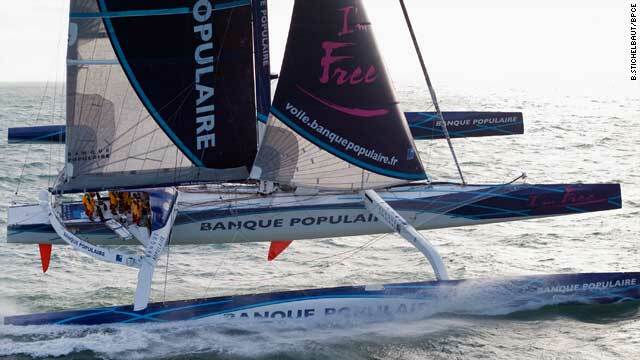 'Groupama' and the 'Maxi Banque Populaire' will not only be battling the chronometer and nature, but an actual adversary," Lamazou added. A former winner of the grueling Vendee Globe round-the-world race, Lamazou told CNN the trophy was created in honor of Verne's spirit: "He is one of the only writers who knew what he was talking about when writing about boats and sailing. The competition is unusual because it has almost no rules when it comes to boat and crew size. Boats can also attempt to beat the previous record at any time of their choosing, provided they register with the organization. "This has allowed for giant boats like the Maxi to participate in a round-the-world race. Most other tournaments have size limitations," Lamazou told CNN. "I wanted to keep the adventure alive and give the sailors of the Jules Verne trophy as much liberty as possible," he said.